Polyethylene covered hoop covered buildings provide an economical storage solution for compost applications. These structures can be easily erected on walls or directly on concrete or asphalt for smaller applications. A variety of cover colors are available to satisfy customer surroundings including white, gray, tan, and green. The open ended structures allow for ideal air and ventilation for optimal compost environmental conditions. 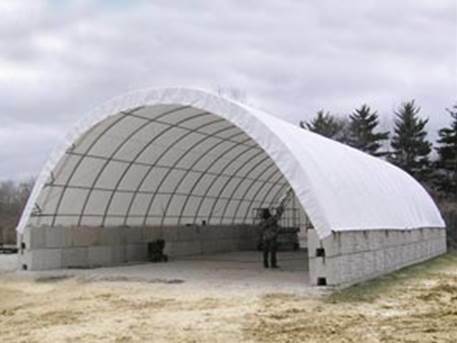 In addition to compost storage applications, these fabric structures are frequently used to store hay, grain, firewood, and other bulk materials. All compost storage buildings include an easy to understand instruction manual which includes photos and diagrams for easy understanding. We offer compost buildings ranging from 12' - 42' wide to accommodate any application. We invite all prospective consumers to view our easy to follow website. Custom quotes are available.